Meet new update tle list of free forex bonuses at my blog. Today I tried new offer from forex broker XM. And, frankly speaking, it’s very good! They give free $30 to all new traders. So, i’ve decided to include this free offer from XM in my list. So, what we know about broker XM? Let’s see at their site. First of all, XM.COM is a trading name of Trading Point Holdings Ltd, which wholly owns Trading Point of Financial Instruments Ltd (Cyprus), Trading Point of Financial Instruments Pty Ltd. (Australia) and Trading Point NZ Ltd (New Zealand). Trading Point Holdings was founded in 2009 by some financial market experts from Cyprus. In 2010 they started work with clients. As a broker, XM delivers to their clients superior services in foreign exchange, along with CFDs on equity indices, precious metals, and energies. XM offers more than 100 financial instruments including forex, equity indices, precious metals, and energies, with transparent real-time pricing, lowest spreads, and flexible leverage. Xm.com operates with an STP execution model. - Authorized and regulated by ASIC (AFSL no. 443670). - Registered with FCA (FSA), UK, licensed under 538324. As for me, XM seems as a good point for your start in trading. 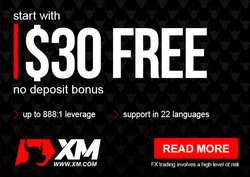 Write a comment to "XM free forex bonus from"